Cohoes - Friede B. Goerold, 98, of Pasinella Way died Wednesday, February 6, 2019, at Eddy Village Green after a long illness. Born in Troy, she was daughter of the late Frank Vanderpool and Effie Cipperly Vanderpool and wife of the late Edward L. Goerold. She had resided in Troy and most of her life in Wynantskill and was a 1938 graduate of Troy High School. Friede was a homemaker for many years and many years ago worked at Pioneer Bank and Knitcraft. 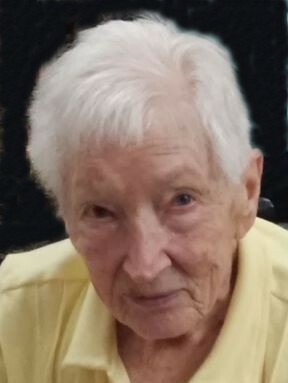 Friede was a lifelong active member and the longest standing member of the Pawling Avenue United Methodist Church, a member of the Friends of North Greenbush Library and enjoyed doing puzzles. She and her husband enjoyed many cruises. Survivors include two daughters, Linda (Bill) Storz, Clifton Park and Pam (Marty) Burke, Loudonville; six grandchildren, Leah Storz, Garth Storz, Janel Weiner, Kira Schettino, Ryan Burke and Eric Burke; 15 great grandchildren, Christopher, Olivia, Logan, Gabriella, and Alexandra Storz, Nolan, Adeleigh, Gehrig, and Jace Weiner, Sean and Evan Schettino and Bradyn, Gavin, Lucas and Emelia Burke and several nieces and nephews. She was predeceased by a son Lance Goerold; a sister, Beatrice Bonesteel and three brothers, Walter, Donald and Winstan Vanderpool. Relatives and friends may call at the Pawling Avenue United Methodist Church 520 Pawling Avenue Troy on Saturday, February 9, 2019 from 10-11 AM with a funeral service at 11 AM with Rev. Karyl Hopp, Pastor, officiating. Interment will be in Memory Gardens Colonie. In lieu of flowers contributions may be made in memory of Friede B. Goerold to the Pawling Avenue United Methodist Church 520 Pawling Avenue Troy, NY 12180.